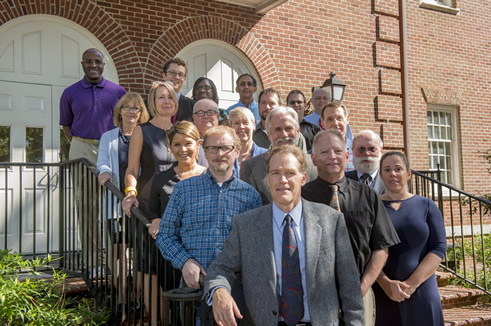 History Department Faculty (Fall 2015). Not pictured: Drs. Jennifer Le Zotte, Yixin Chen, Venkat Dhulipala, Chris Fonvielle, and Eva Mehl. As usual, the UNCW history department will be an active place during the 2018-2019 academic year. We'll be offering many new classes, leading great public discussions, publishing new materials, and offering lots of opportunities for you to learn more about history. Some interesting career news - according to the last survey of recent graduates, the History department is the department in the College of Arts and Sciences with the HIGHEST PERCENTAGE of our former majors in graduate programs. These include programs in Law, International Relations, and Education as well as History programs. Nearly 40% of our graduates wind up in graduate school. We will have some opportunities this year for majors to learn more about graduate school options in many areas. Remember, we offer several classes each semester that have unique topics. Check out the list below to see what next semester has in store. This course is a hands-on, intensive seminar in how to conduct historical research and write a major paper. The topic we will consider is the Russian Revolution of 1917, which was not one, but actually two, revolutions. Using primary sources, historical monographs, and films we will dig into the most surprising and consequential events of the twentieth century. This course will explore the many ways in which the American public has used history in the past, and continues to use it in the present, through celebrations, monuments, museums, and historic preservation, and in the writing of history for the general public. We will be asking both how and why people have viewed the past as they have and how the public’s engagement with American history changes over time. This course explores the interactions between humans and alpha predators in the modern world. We will discuss tigers in the Russian Far East, lions in India, brown bears in Eastern Europe, and mountain lions in Colorado. In doing so, we will examine how these and other large carnivores have intersected historically with politics, culture, and the environment. Though this is a history course, the class will also utilize sources from psychology, ecology, and anthropology to understand the various ways that alpha predators have come to shape our physical and psychological worlds. This course is a broad study of the Vietnam War covering the period from World War II to the reunification of Vietnam in 1975, though many events and topics before and after this period with be discussed to provide a proper perspective of the war and its implications. The course will focus on historical background, colonization and decolonization, ideologies, causes, strategies and tactics, battles and campaigns, technologies, politics, culture and the arts (the music, film, and literature of the war and the anti-war), international relations, diplomacy, social impact, economics, and historiography (the battle over who won or lost the war and what should have been done). The course will answer the question, “Why did the United States win every battle of the Vietnam War, yet still lose the war?" This course will examine Jewish history from the Bible until the early 1500s. We will begin by exploring the emergence of the ancient Hebrews, the first monotheistic people, whose religion fundamentally transformed life in the ancient near east. We will compare and contrast the Jewish encounter with the great civilizations of the pre-modern era, including the Roman Empire, the world of Islam, and Catholic Europe. As the Jewish people migrated to distant lands – to Persia, to North Africa, to Spain, and to Poland – their customs and values evolved to meet the needs of their new environments. Jewish life before modernity was characterized by its great diversity. Yet amid this great diversity the Jews always possessed a sense of unity, sustained by their religion and by the cherished memory of their mythic origins in the biblical days of the patriarchs and the prophets. This course for both History majors and non-majors combines lecture and discussion formats to consider the contemporary history of Russia from the unraveling of the USSR under Mikhail Gorbachev in the late 1980s, the first efforts to create a new government and economy under Boris Yeltsin, and the surprising rise and reign of Yeltsin's famous successor, Vladimir Putin. We will consider developments in politics, foreign policy, culture, religion, environmental policy and economy. This course will explore how the United States has come to define its political, strategic, economic, and moral interests in the Middle East from the founding of the American republic to the current U.S. embroilments in Iraq and Syria. It will examine the multi-dimensional history of the diplomatic, commercial, and cultural relations between the United States and the lands of the Middle East and will demonstrate how the definitions of U.S. interests in the region and assessments about how best to secure them have been shaped by cultural biases, domestic political factors, and the actions of non-state actors such as missionaries, oil companies, and the media. This course introduces students to how history is practiced and presented to, for, and with public audiences. We will consider traditional venues such as museums, historic houses, and battlefields, and more contemporary modes, such as digital exhibits, social media, and podcasts. This course is intended to blend theory, historiography, and experience, while also offering an overview of history beyond the classroom--and its joys and challenges-- from the points of view of those who do it. This course surveys the development of the American South from the colonial period to the Civil War (1861). We will analyze the political, social, cultural, and economic dynamics that contributed to Southern “distinctiveness” in history and in memory. Inquiry begins with the development of the original Southern British colonies, highlighting the relations between colonial settlers and Native Americans, and examining why indentured servitude faded in favor of African slavery as tobacco became an increasingly important cash crop. Attention then turns to the antebellum South, focusing on the lives of masters, mistresses, and slaves on plantations. We will trace the development of the Southern class system that hinged upon slavery and analyze how this political and class system led to secession and, ultimately, the end of the Old South. This class will investigate a range of topics related to Colonial America, beginning with European exploration and the conquest of North American in the sixteenth century and concluding with the French & Indian War in 1763. Topics we will explore include: how the imperial powers approached colonization and their struggle for control of the continent; European relationships with Native Americans; the social, cultural, and economic differences between the British North American colonies; the rise of African slavery; colonial gender norms; the role of religion in the colonial project; and the intellectual and political developments that helped give rise to a distinctive colonial identity. A survey of Japanese history from the dominance of Tokugawa Shogun in the seventeenth century until Japan's present developments. The course pursues three themes: Japan’s modern transformation under influence of Western civilizations; the rise and fall of Japanese military imperialism around World War II; and the evolvement of Japanese capitalism in the second half of the twentieth century. It also pays attention to Japan's social changes from its early modern era to the twenty-first century. The course offers a comprehensive understanding of Japan's recent past. With a focus on work and labor, this research seminar will examine various aspects of history of twentieth-century Europe—World War I, Italian Fascism, Russian Revolutions, German Nazism, Popular Fronts, Spanish Civil War, World War II, Holocaust, Cold War, and the 1960s. Are you interested in learning about historical controversies focusing on basic civil liberties such as freedom of religion, free speech, and the guarantee of a free press? If so, sign up for this research seminar. We will also examine current debates over (to name a few): religious displays on public property; whether offensive public protests are protected “speech”; whether there is a constitutionally-guaranteed right to die; and, whether some forms of discrimination are legitimate exercises of religious freedom. Indian Cinema has achieved fame around the world as Bollywood. This course will utilize Bollywood as a mirror to understand political, economic, social and cultural continuities as well as changes that have happened in India over the last seven decades since it became an independent nation-state, free from British colonial rule. We will explore how these films reflect and also shape the hopes and aspirations of millions of Indians besides providing at times the only common point of identification in a vast land with enormous diversities. The films that we shall watch, read about, analyze, and discuss, reflect certain themes that have acquired salience and hence are relevant for understanding Indian State, society, and popular culture. These include Mythology, Partition, Nation Building, Development, Indian State and its Discontents, Religious Conflicts, Kashmir, Family in Modern India, Diaspora and Home, Democracy, Empire & Cricket, and Women in New Cinema. Students will watch a film per week and participate in discussions that will reflect upon the readings that are relevant to the film (books, essays, and articles), write short response papers besides a final paper for this course. In addition to providing a window to understand culture, society and State of one of the most diverse countries in the world, this course will also be Fun! Where were the boundaries of the medical world in early modern Europe? What constituted medical treatment and who was able to access it? To address these questions, this seminar will examine the creation, transmission, and exchange of medical knowledge, practices, and goods in the early modern period. We will also consider how European medical knowledge has been constructed, the blurred borders between medicine, magic, and marvels, and the growth and legitimation of the medical profession. Dr. Angela Zombek has joined our department. She specializes in Civil War Era history. Dr. David Houpt has joined our department. He specializes in the American Revolution and Early National Period. Welcome! UNCW is lucky to have you.